If You Plant It, They Will Roll: One of the zillions of successful tree transplants (this one at Wynn Resorts in Las Vegas) conducted by Environmental Design. Members of the Toomer's Task Force have been in contact with the Houston-based company about the possibility of planting new trees at Toomer's Corner. There is apparently some idea or proposal going around that we should put artificial trees or, worse, metallic treelike sculptures at Toomer’s Corner. That cockamamie idea sounds like something dreamed up by a well-meaning fan of another school trying to be helpful or a member of Academe, either way someone who doesn’t understand what Auburn is all about. Artificial trees or metal trees at Toomer’s Corner? Bah. Humbug. But then, should the trees die, what—if anything—should replace them? Housel has an answer. Judging by several emails we’ve received, and comments left on our post investigating the possibility that the heart of downtown Auburn indeed might soon feature some sort of structure built specifically to be rolled with toilet paper, he isn’t alone in his thinking. The question then becomes whether a tree transplant in a space as restrictive—and in soil still as poisoned—as that in the Toomer’s oaks plaza is even possible. According to the one man who should know, yes it is. “If the Toomer’s oaks were to die and the decision made to replant, the University would have several options,” says Dr. Gary Keever, an endowed professor in Auburn’s Department of Horticulture. As point person for the Toomer’s Task Force, Keever has almost become a household name in Auburn since news of the oaks poisoning was announced in February. But the viability of smaller trees wouldn’t be guaranteed. And likely kept free of toilet paper; fans wouldn’t be have to be as mature if more mature trees were planted. In business since 1977, Environmental Design transported and planted the 437 custom-grown mature trees at the World Trade Center Memorial grove and have handled numerous jobs (many of them oak transplants) on university campuses. 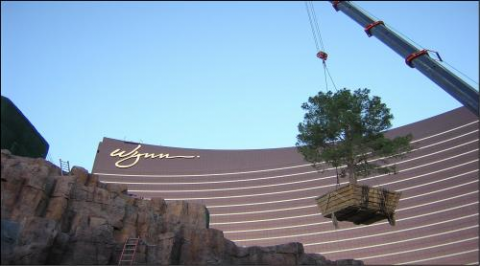 According to the company’s website, its tree transplants have a 98 percent success rate. Cox, an avid college football fan, has kept up with the Toomer’s oaks story from the beginning. Apparently, they kind of already have. If the Auburn Family does come to that bridge, Keever says that he would recommend crossing it now with small or mature trees but with one or more large, “4-10 inch caliper” trees. Related: Toomer’s Corner rollings didn’t start with Punt, Bama, Punt, says History / Auburn fans start “Unrolling Toomer’s” tradition. / Did Auburn students celebrate Bear Bryant’s death by rolling Toomer’s Corner? I love this. Although secretly I’d held out hope for a 60 foot tall stainless arch across Magnolia. Oh well. Preach on brotha Housel….preach on. I would hope money wouldn’t be an issue. I think we have enough rich alums that could donate their pocket change to help save a tradition. Bo, Barkley, etc. wouldn’t even notice the money gone from their accounts. Completely agree with Mr. Housel. Money should not be an issue and at $100K I would not think it would be. Pass the bucket at the next two Auburn games, everyone donate $1, and you will have $100K right there. I know when my grandpa (the first of many Auburn men and women in our family) built his house, he went down to the Coosa River and dug up four good sized water oaks and planted them at each corner of his yard. I wasn’t around back then, so I don’t know exactly how big they were, but I understand they were much bigger than just saplings. So I know it can be done. updyke university should be required to pay the bill. What happened to all that fake cash supposedly raised by them? Updyke is a hero to the majority of that cult fan base and are probably working on a statue in his honor. Go big or go home. I have a pretty good feeling that if a donation website were set up, you would have enough money to do the project right in less than a week. That would be the AU family at work. Once the trees do die the university could have a woodworking expert(s) cut the tree up and make artwork out of the pieces and auction them. Put all the pieces in the jules smith art museum on display for a year and let everyone get a look at them then have a silent auction or put pics in the program and text in your bids. That’d raise $100K easy! Keep a big nice piece for the museum at the athletic facility. In this format the university would foot the bill for replacements while the woodwork was being done, but it would be reimbursed by the proceeds and we aren’t exactly cash strapped based on the figures I see floating around. While we’re at it, how about planting more large trees all over campus? I was shocked the last time I visited Auburn at the lack of big trees — so different from my memories of my time there, when there were huge trees everywhere. Excellent idea, Auburn should be a forest. A lot of the big trees in Samford Park have been damaged/destroyed years past by hurricanes and updykes.